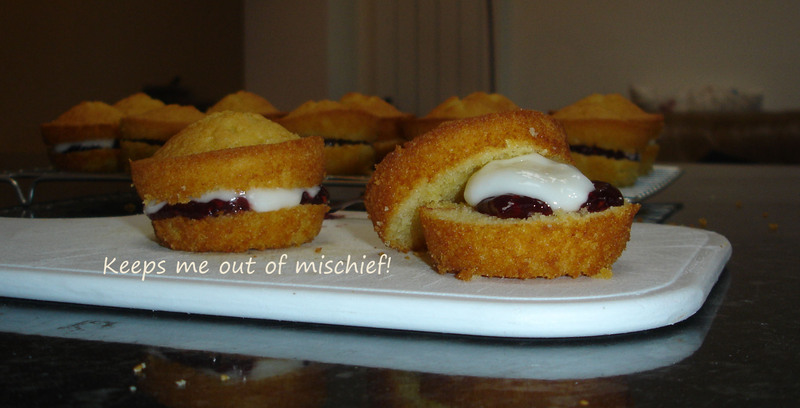 Alphabet Blogging: V is for Victoria Sponges | Keeps Me Out Of Mischief! I have been reliably informed by friends with children that when they had newborns the thing that they really wanted everyone to bring when they came to see the new addition wasn’t another babygrow or incredibly cute but impractical outfit, but food! So tomorrow we are going to visit some friends of ours who had a new addition to their brood a couple of weeks ago and I’m taking them these mini Victoria Sponges. I’ve already sent them a practical present in the shape of a nappy changing mat and I’ll make something for the sprog to play with once it’s a bit bigger! Victoria sponges used to be really popular in the UK but you never really see them anymore; I really like them as they have to be the quickest and easiest cake to make in the whole world! I need quick and easy this weekend; I have a ridiculously high pile of marking to do from work and I need to multitask, so the easier, the better! For the Victoria Sponge you will need: 175g butter, 175g caster sugar, 3 medium eggs and 150g self-raising flour. Firstly you need to grease your muffin tray – I know it’s non-stick but I don’t trust it with these babies! I could line each dish with a muffin case but then I’d just be taking them all off at the end! So grease away! Preheat the oven to 190°C. Cream together the butter and sugar, add the eggs one at a time and mix in thoroughly. Sift the flour and add to the mixture. 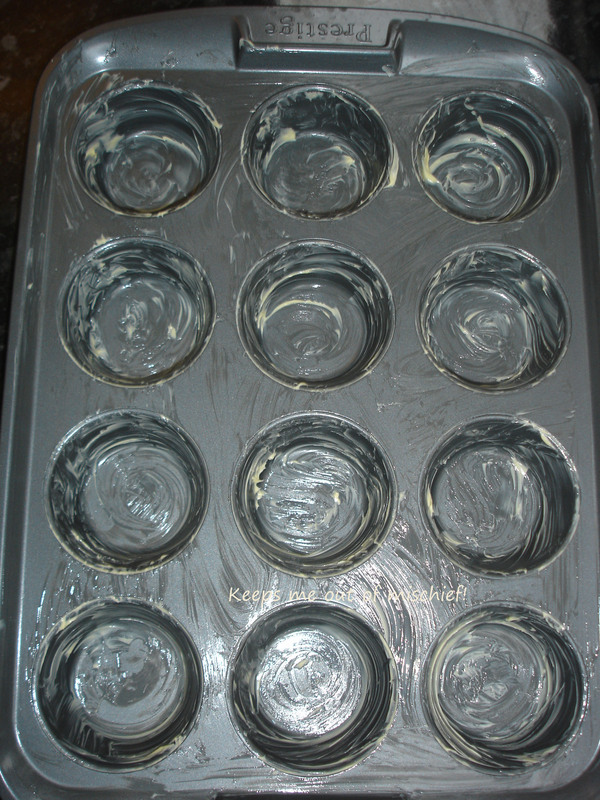 Share out into the muffin tray making sure the batter is fairly flat in each compartment. Place in the oven for 20 minutes or until a skewer stuck into the middle of the cake comes out clean. 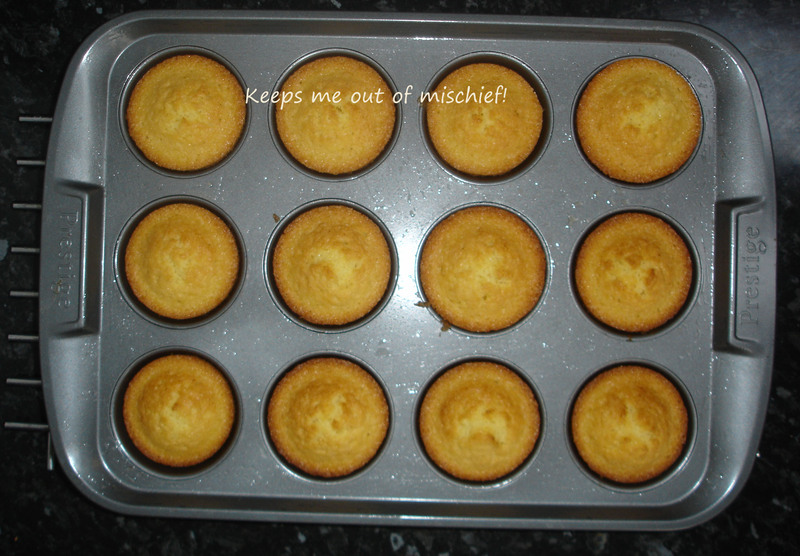 Allow the cakes to cool in the tray. Use a plastic implement to get them out – be gentle. I have a plastic picnic knife that I keep for occasions like this – they came out fairly easily. Good greasing! For the filling you will need: 12 tablespoons of jam (I’ve used raspberry, but only because it was in the cupboard! ), buttercream made to your desired consistency using 50g butter and icing sugar. Slice the cakes horizontally and place a layer of jam then the icing before putting the top back on. I had been thinking about filling these with the left over chocolate frosting from the Frosted Nutella Cupcakes that I made a couple of days ago, but there doesn’t seem to be any left……. it appears that it’s very nice spread onto digestive biscuits! Present to friends with small children and watch them disappear before your eyes!